Insulin pumps liberate the diabetic patient from frequent injections. 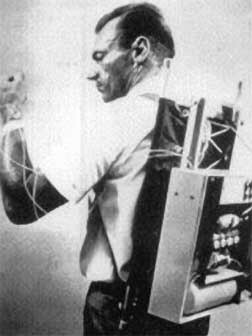 The first pump was introduced in the 1960s but was impractical owing to its size, which was about that of a backpack (top right). With advances in technology, the modern pump is no larger than a pager (picture in the middle). A sophisticated chip and software ensure that insulin delivery is programmable and allows the patient more leeway in his / her lifestyle. Type 1 diabetics (the insulin dependent variety) greatly benefit from using this technology; the alternative is life-long basal-bolus insulin treatment comprising several injections daily. 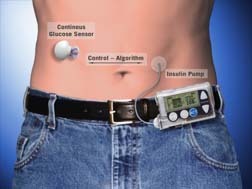 The future is set to see the integration of continuous glucose monitoring with insulin pumps. An example of this is shown in the bottom-most picture where the device monitoring glucose continuously sends the glucose information wirelessly to the insulin pump. The user has the option to over-ride the pump's settings.